Osteoporosis is another condition that affects mobility. Otherwise known as fragile bone disease, osteoporosis often develops due to age and lifestyle factors. It can also be caused by diseases and medication. It causes bones to become weaker, which can lead to fractures. It is often difficult to detect, but a bone mineral density test can pick up on whether you're at risk - if it detects weak bones, you're more likely to develop the condition. There are often no visible symptoms, and in some cases, it is only diagnosed after breaking or fracturing a bone. Make sure that your diet is rich in calcium to promote bone density. After going through the menopause, you need to up your calcium levels, as this is the point at which women's bones become weaker and more prone to breaking and fracturing. 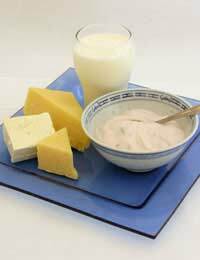 Milk, dairy products and sardine bones are good sources of calcium. Supplements are also an option (see our articles on 'Using Supplements (e.g. Cod Liver Oil) in Old Age' and 'Nutrition For Healthy Bones and Joints' for more advice on preventing and treating osteoporosis through your diet. Vitamin D is also important for osteoporosis, as it helps to keep your bones strong and healthy. It also helps your body to absorb calcium more easily. After the age of sixty, you need much more vitamin D than you did up until that point. Sunlight is one of the best sources of vitamin D, but you can take supplements to boost your levels when that's not forthcoming. Gentle exercise on a regular basis is another good way to treat osteoporosis. Weight bearing exercises can be particularly beneficial. There are other changes that you can make to your lifestyle to cope with osteoporosis. These include giving up smoking and reducing the amount of alcohol that you drink. It's also worth checking with your doctor to see if any medication that you are currently taking isn't likely to cause osteoporosis, both now and in the future. Bisphosphonates: These slow done bone loss and help to reduce the chances of fractures. These are taken orally on an empty stomach and it's common for them to cause stomach upsets. Because of this, you need to stay upright for a minimum of one hour after taking the tablets. Calcitonin: This contains thyroid hormones and can help to prevent spinal fractures. Hormone Replacement Therapy (HRT): This usually replaces oestrogen (low levels of the female hormone make the development of osteoporosis more likely) or progestin (this hormone is believed to reduce the risk of fractures in women who have been through the menopause). A combination of the two can help to lower your risk of developing fractures further down the line. However, there are potential side effects. The two combined can increase your chances of developing strokes, breast cancer, blood clots and heart problems, while oestrogen therapy on its own can increase your chances of having a stroke. Your doctor will be able to discuss whether the positive outweigh the negatives in your situation. For mild cases of osteoporosis, you may find that making minor adjustments to your lifestyle and being prescribed a specific type of medication is adequate enough to treat it. However, if you have a more serious case of osteoporosis, your doctor will be able to advise you on the best course of action.